The tea category has become inundated in a sea of overworked clichés – from stodgy heritage, to exotic origins, from the mystical to the medicinal. Finding what you really want can be exhausting. Hain Celestial gave us a call with an opportunity: Why don’t we create a new brand of tea that can break through all that BS at shelf with the simple benefit of flavor forward, all-in-one wellness that we’ve been wishing for? (Oh, and let’s get it to market in under 7 months). Today’s time-strapped consumers don’t want to have to choose from a laundry list of tea ingredients, flavors and benefits designed to address singular ailments (Ginger tea for upset stomachs? Sounds like medicine.). They want an all-in-one experience – a delicious tea they can drink every day to support their overall wellbeing. 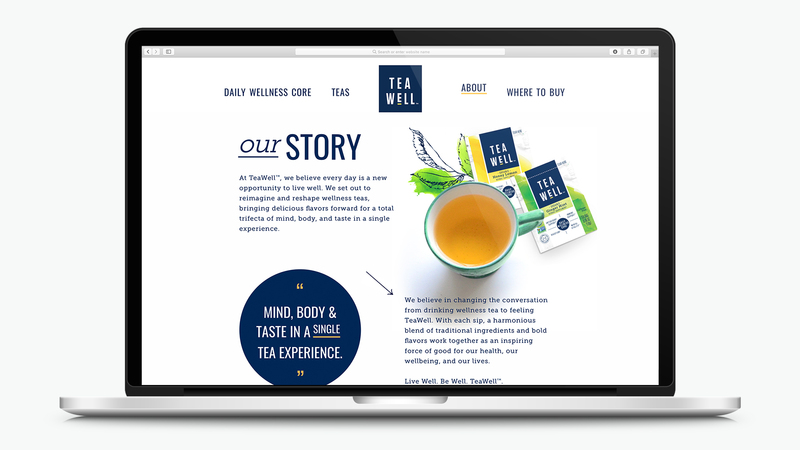 Through a highly focused and iterative series of design sprints, we worked with Hain to create a fresh, new brand that sought to shift the conversation from “drinking wellness” to simply feeling TeaWell™. In creating the TeaWell™ brand, we set out to reimagine wellness teas, bringing delicious flavors forward for a total trifecta of mind, body and taste in a single experience. The brand’s identity and packaging design centers around the daily wellness core of mental vitality, antioxidant, immune, and digestion support. The vibrant watercolor artwork is used to express the taste excitement of each flavor. Entire brand creation – from concept to brand purpose, brand meaning, packaging design, website design, launch and stocking store shelves – was completed in 7 months. 100% of the team who worked on this initiative are still feeling very TeaWell™ to this day.